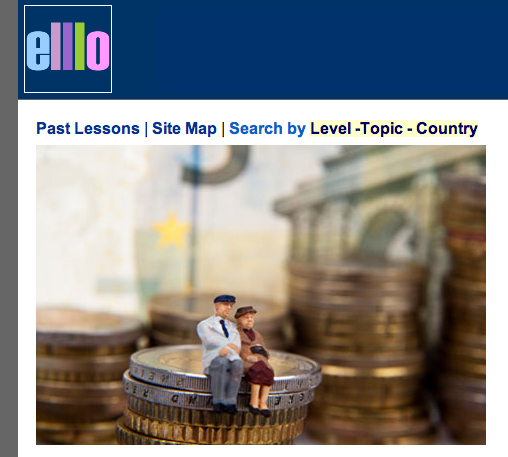 This is the third in a series of posts whose goal is to explore ways of helping learners develop their language skills autonomously. The first two posts are specific to listening. The first post, which focuses on perception of connected speech can be read here and the second post on dictations as an autonomous learning tool here . This post doesn’t focus specifically on listening skill development but I have decided to include it in this series as it focuses on an autonomous learning activity. So I hereby declare the series focus expanded! So that was the workshop. 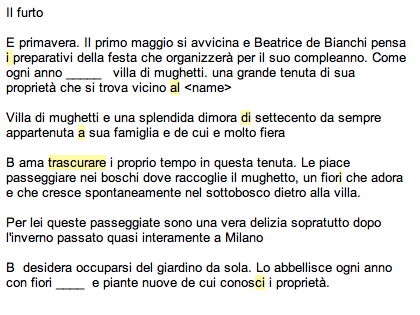 What excited me is that “text mining” is something I have been doing myself, autonomously, on a regular basis this summer, in my Italian learning. Only, I hadn’t given it a label, it was just something I do and have found a lot of value in, particularly because of what I’ve done with the language mined post-mining. So the focus of this post isn’t on text mining as a means of working on spoken fluency in the classroom, but on text mining as an autonomous activity for bridging the gap between receptive and productive skills. Texts! Of any description – the more varied, the better. Obviously if that was it, it would be a bit useless. A sort of “ah that’s a nice chunk…ok, bye bye chunk.” The trick is recycling. And lots of it. Of course seeing it used (or if not specifically it then a variation of it – that often happens) in further reading/listening is great – but if you’ve forgotten about it you might not notice it and you are also unlikely to produce it. In order to avoid this, I like to use Quizlet. I input the chunks – so already that makes me focus on them some more – and then I use the learn mode (generally on my iPad because I prefer the mobile app learn mode to the website learn mode) to help me memorise them a bit. That way, I’m more likely to remember them when I come across them again. And I do! Come across them again, that is. Still not enough. Further steps much depend on the chunk. I have variously i) tried to manipulate it if it is not a fixed chunk (could I make it refer to another time frame? could I make it stronger or weaker? how formal is it? what is a more/less formal way of expressing that? could I change the context of use/topic?) 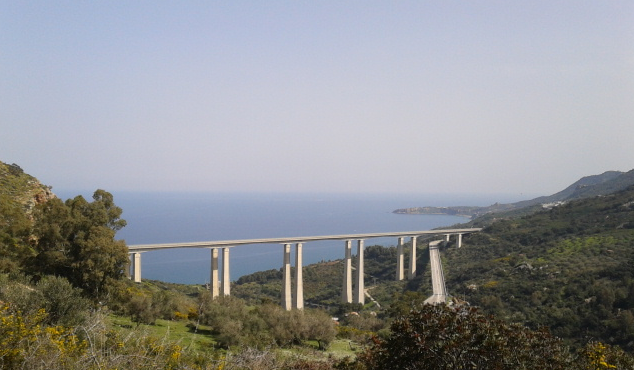 ii) tried to use in the little blog posts I write on my Italian post iii) tried to use in conversation – currently limited to Facebook chatting but once I’m back in Sicily…! iv) used it while talking to myself. And I really do think talking to yourself in the target language has value. It may mean you are crazy, I don’t know, but it’s a great way to experiment with language in a very non-threatening way. Doesn’t even have to be aloud, can be internally, in your head. I usually do it aloud when I’m cycling to and from work! I do it internally at various other times. v) used it during my weekly self-recording speaking sessions. vi) tried to use all my linguistic resources, including those acquired in this way, in my solitaire “scrabble” games. Over time, I become aware that these chunks, that I wouldn’t have produced before, have made their way into my active productive language resources. 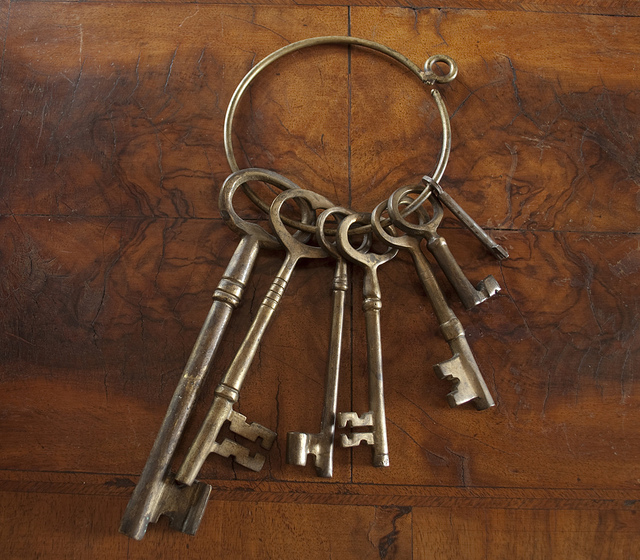 *The* keys! 🙂 Image taken from Google image search for images licensed for commercial reuse with modification. Variety of activities – for genuine recycling. And I think language learning contracts may play an important role in this: I didn’t do a wide variety of learning activities regularly until I made myself a contract, and it is only through making myself (initially) follow that contract that I discovered how useful variety is. They started off as discrete individual activities on a list, but by doing them and learning more about them and how to benefit as much as possible from the interplay between them, they have now become a sort of language learning web, catching new language for me. I think in terms of scaffolding learners, then my Experimenting with English project (or anything along similar lines) could be helpful too. 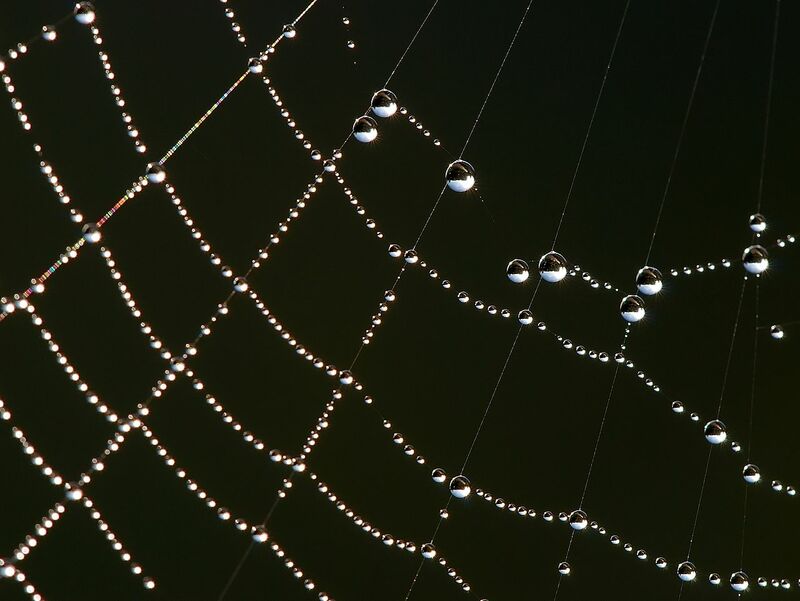 A web for catching language! image from commons.wikimedia.org via Google search for images licensed for commercial use with modification. Being on the look out for “your” language. So that when you hear or see it, you get that little glow of recognition. Being willing to talk to yourself and experiment with the language that way. And talk to others too, when the opportunity arises. Being selective – or you highlight the whole book/article/whatever. And I think this would be the most difficult thing for learners. 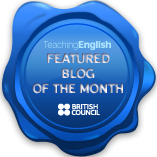 However, perhaps this is another facet of the activity as described in the opening to this blog post, as a classroom activity for scaffolding speaking. Perhaps it can be used as a way of helping learners become better able to use it as an autonomous learning activity. I.e. get them to discuss what chunks they’ve chosen and why. How could those chunks be useful? Having time off: I still do a lot of “just” reading. I’m not reading to stop every ten seconds to highlight. If a chunk really stands out, I’ll grab it. But because of how this seems to work, even when I’m “off” – I’m still very tuned in to noticing any language I’ve grabbed previously. But I don’t transfer it to Quizlet immediately necessarily. Sometimes I do – if it’s a – to me – particularly yummy piece of language and my computer is to hand. But often I let a handful “build up” and then transfer them over and start working on them. So, it’s not intrusive to the reading. I think on it as a sort of “active” reading/listening – rather than just letting it all wash over me, in the hopes that some might stick, I’m actually doing something to start making it stick. For me, yes. Absolutely. My productive language resources have increased a lot since I started my language learning contract (i.e. doing a variety of activities including text mining) My receptive skills have improved too, but I think this approach has helped the gap between my receptive and productive skills to not widen in the process. “Process” is perhaps the key word. This is more of an on-going process than an activity, really. More of a mindset that I’ve developed, which I think is useful for approaching language learning. For other learners? Further research is needed! I shall be experimenting come October… Meanwhile, try it out with your learners and let me know! This is my learning contract, dutifully copied and pasted into Evernote! I also promised an update regarding my use of my learning contract, and its effect on my learning, one month on. And here we are, one month on! That was quick. 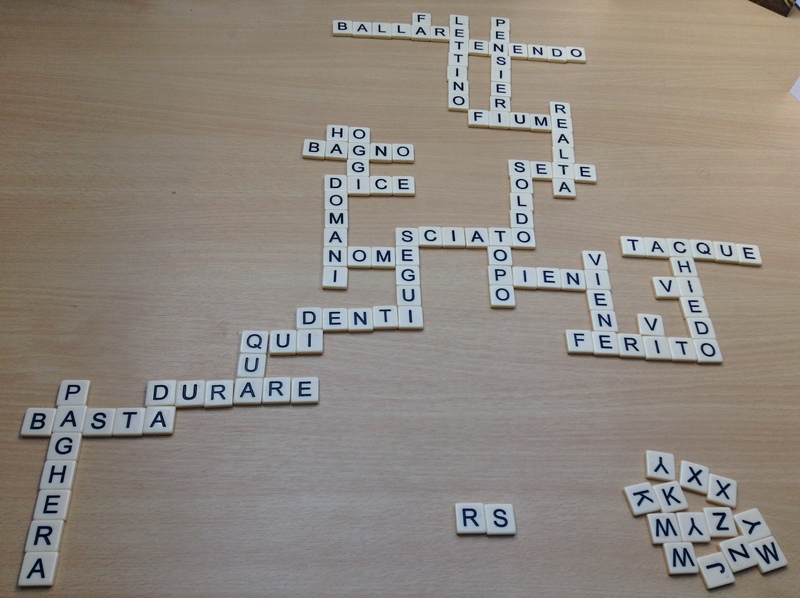 I am happy to say that learning Italian has become a regular feature in my days and weeks, despite the last two being swamped by induction into a new job and first week doing said job. Have I managed to keep to my contract? I would give myself 97% success rate of sticking to the contract. (My maths isn’t great but there were lots of successful days and only three non-successful days.) Also, with regards to extensive listening and reading, on the majority of days I have done more than then stipulated 20 mins a day. What difference has it made to my learning? It’s motivated me: If I didn’t need to do all those activities each week, I wouldn’t be waking up extra early to get something done before going to work, for a start! And I’d probably just be drifting along reading and listening a bit. Also, the noticing (bullet 1) has become another motivating factor – I love it when something I’ve learned from one activity crops up in another! It’s given me a sense of control over my learning: I chose the activities, and how I fit them into my week is flexible. I think a week is a useful unit. It means you can have slightly more and less productive days, though by the nature of my contract some stuff needs to be done every day, as long as within a week you do everything you stipulated in the learning contract. The quantity of stuff encourages piecemeal chipping away at it. Also, by keeping a record of what I do each day, I know exactly where I am with my list and what I still need to do in any given week. I manage my study time accordingly. 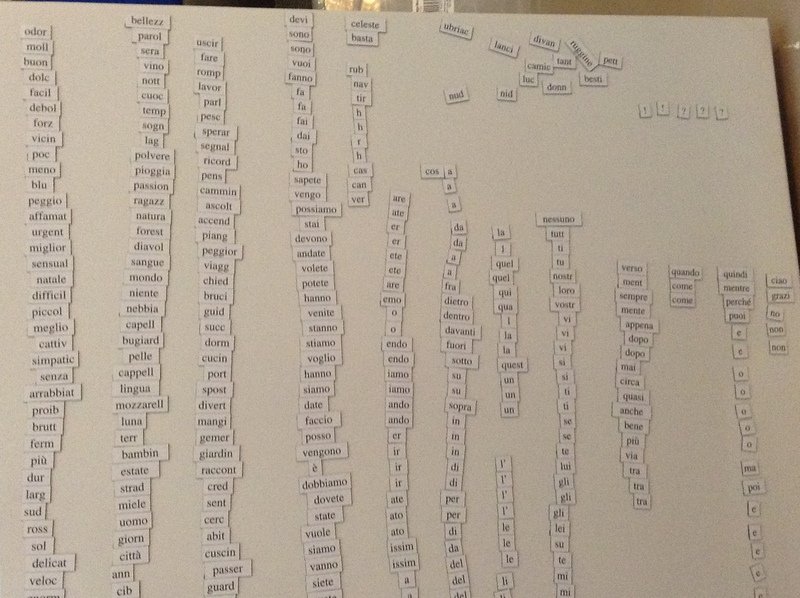 I particularly enjoyed classifying All The Words…well, nearly all! I haven’t used them as much as I would have liked though. One of my goals for the next month is to experiment with them and try to find different ways of using them. I’ve discovered more about how the activities I do can be useful. A good example of this is dictations: dictations are back in fashion these days, various versions (e.g. running, shouting etc. dictations) are popular in the classroom, and some websites offer learners the opportunity to use them outside the classroom too. I hadn’t thought about dictations as an autonomous listening development tool, but through using them myself, I have understood more about their potential, which resulted in this blog post. This is something I will be able to pass on to my learners. Variety is great: Doing a variety of activities increases exposure to language, productive use of language and recycling of language in different contexts. This can’t be a bad thing. Record-keeping is key: It’s so much easier to operate when you know what you’ve done and what you want to do within a given time-frame. Having a record of activities done (and lengths of time where relevant) is also motivating, as the list grows. Reflection is satisfying: I did a written reflection each week, looking back on the week and what I’d achieved as well as how I felt about my progress. It’s very satisfying to reach reflection day each week and look back on a week full of activities and the new relationships emerging between said activities. Activities don’t have to involve “meaningful use of language” to be meaningful and valuable: As long as there is variety and within that variety there are activities which do involve meaningful use of language, other activities e.g. Quizlet and dictations etc. have their place too. Both, for example, have improved my spelling! 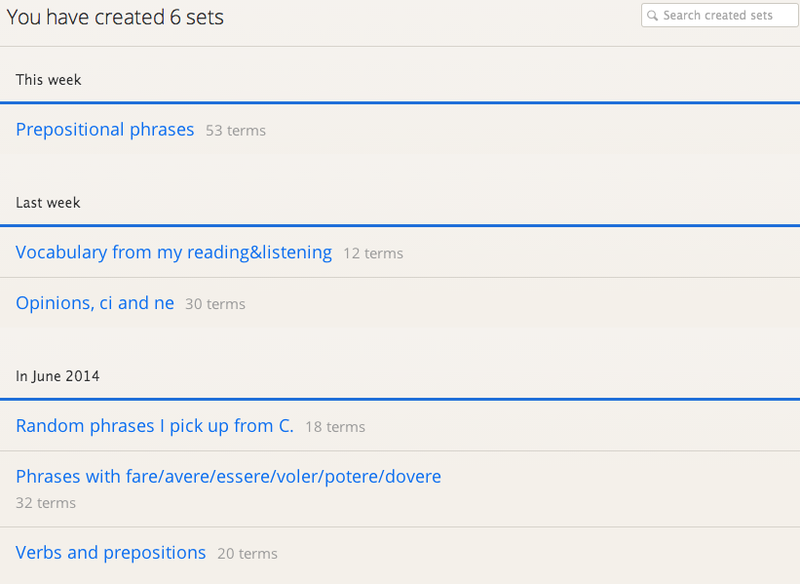 Quizlet has improved my recall, dictations have improved my decoding skills. How activities interact is also key: Within a variety of activities, it’s helpful if you can link them together, and thus wind up doing a lot of language recycling. E.g. picking up a phrase through a dictation activity and then using it in a Facebook chat. Real communication is hugely motivating: I’ve enjoyed several chats on Facebook, with an Italian IHPA colleague of mine. Chatting with C. has given me the opportunity to experiment with the language that I’ve picked up through other activities and get feedback on what I produce. It’s also been a lot of fun, nice to keep in touch, and the source of a lot of learning. 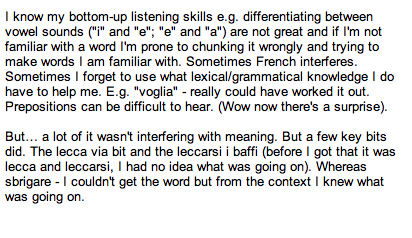 As I said, I’ve taken language from other activities to the chats, but also vice versa – e.g. recording what I thought were “good” phrases on Quizlet and using it to learn them. I’m particularly lucky because she uses a range of error correction techniques, and for the majority of the time these a) make me think and b) don’t disrupt the flow on the conversation. Continue following the LC!! It’s working so far, can it work for another month or will I lose interest? 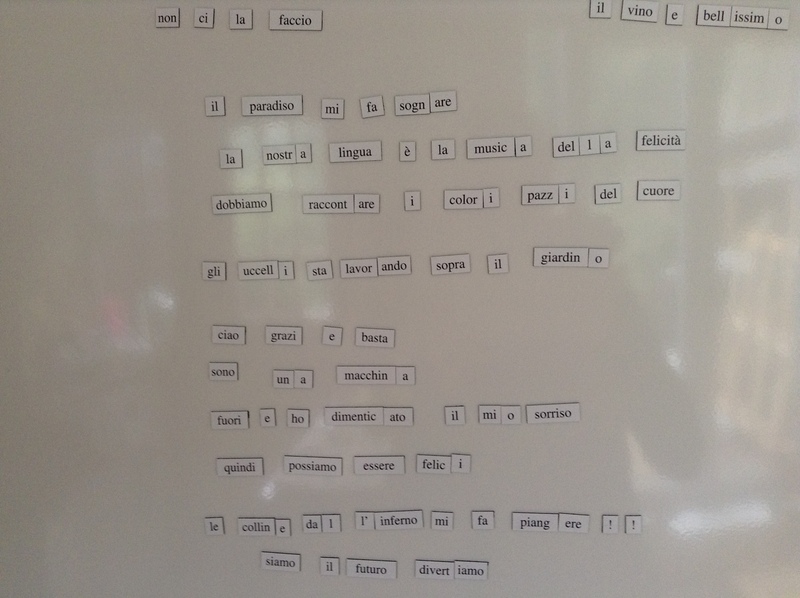 Experiment with the magnetic poetry and figure out how to make it work for me. 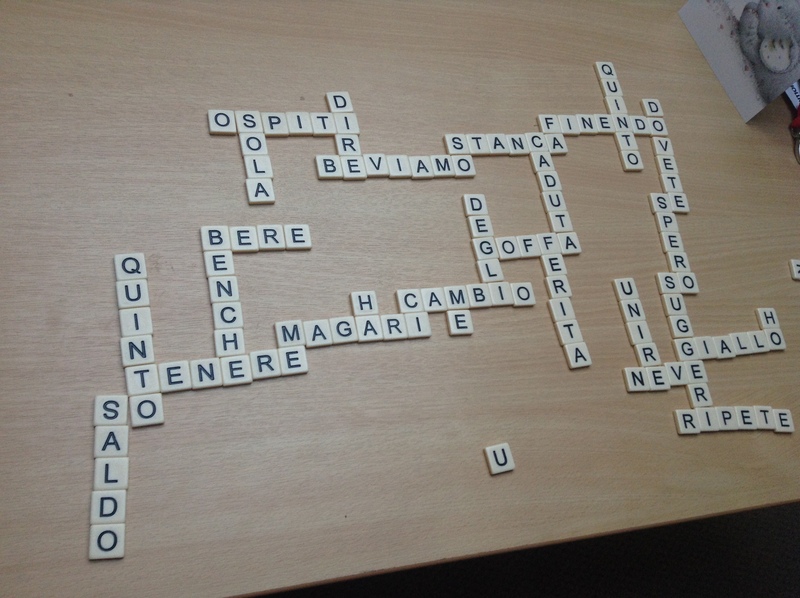 Investigate Italian corpora/concordancing tools (they must exist!) 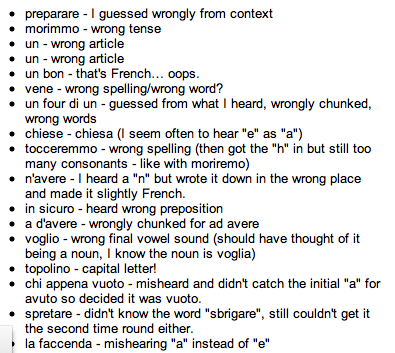 and find one that works for me: when I learn new words, I often think it would be really useful to have an Italian version of www.wordandphrase.info to generate a bunch of examples of that word/chunk in use, so that I can see how it used, rather than only knowing what it means and say one example of use. My first research question remains unanswered: a longer period needs to pass before I’ll know whether the LC has helped me maintain motivation over a longer period! My second research question seems to have been answered positively thus far: Yes, I have managed to do what is on my LC and then some, and yes it has definitely made a difference! Next update due: 5th August 2014: I shall report back on all my goals and progress with my LC then. This is the second post in a series of posts whose goal is to explore ways of helping learners develop their listening skills autonomously. You can read the first post here. 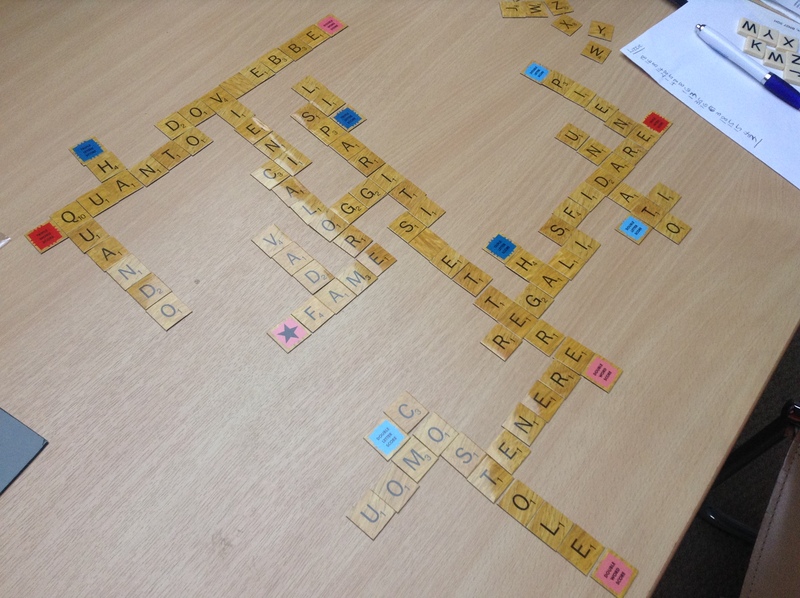 This post is not going to focus on the use of dictations as a classroom activity (for some great ideas relating to classroom use of dictations, have a look at this great recent post of Marek’s) but at their use as a tool that students can use autonomously to work on receptive pronunciation/decoding processes, writing (in terms of spelling and punctuation, but potentially also grammar) and vocabulary. 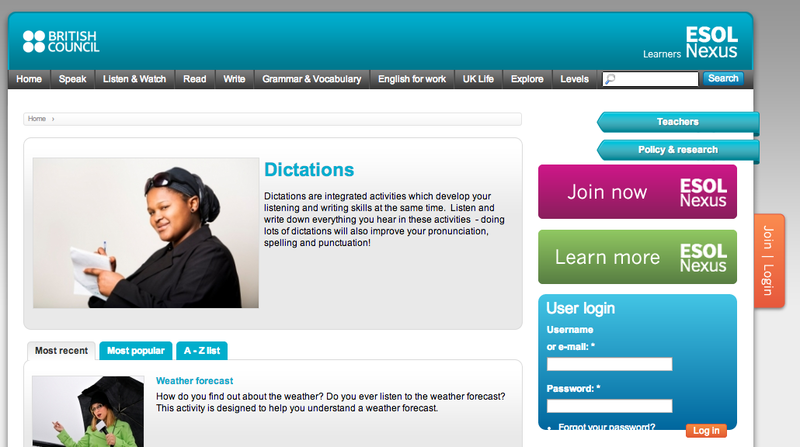 On this site, amongst all the other things they can do, learners can choose from a list of dictations. As you can see, the dictations are labelled according to difficulty. The learner listens to the text and writes what he or she hears, in the box that is next to where it says “Guess“. If the word is correct, it will appears in the correct part of the right-hand box. The asterisks in this box correspond to the letters in the words that the learners will hear, and the gaps between them indicate where each word ends and another begins. I think this is a valuable starting point for learners: these clues will help them become better at chunking correctly and hearing words within a speech stream. Of course, the instant feedback is useful too. Here you can see tasks on word stress and identifying the verb. Other tasks I saw while playing with the site include counting the words, identifying the connecting sound (choosing between /r/, /w/ ), and distinguishing between sounds. 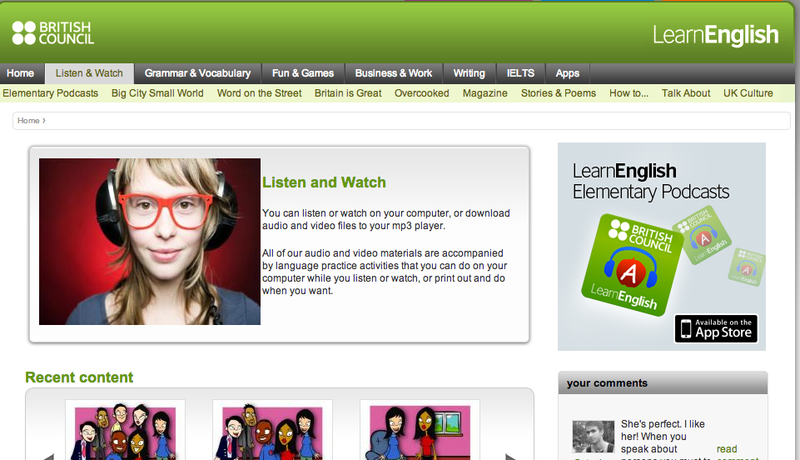 If your learners are not interested in productive pronunciation, they can always ignore the “listen and repeat” parts! So this website not only allows learners to use dictations autonomously, but also builds up an awareness of receptive pronunciation that will come in handy if they try to use other tools (e.g. recordings and transcripts) to do dictation-like activities. As a teacher, you could perhaps have a look at the tasks this website sets alongside the traditional dictations, and adapt them for use in class. As you can see, in addition to the title, the nationality of the speakers and the level of the recording are also provided. 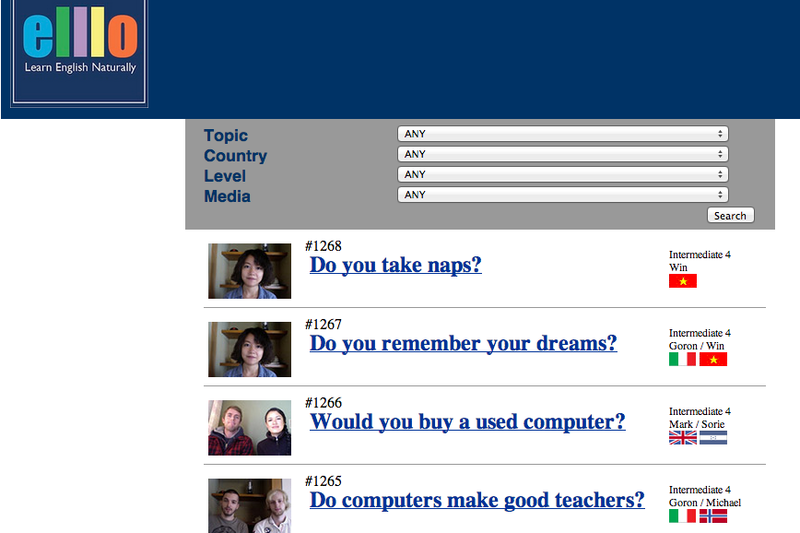 This site is good because it is not “native speaker”-centric. So for learners who are interested in using English as a lingua franca, rather than speaking to native speakers, this might complement other sources very nicely. That there are different levels of recording is useful too, as it makes using the recording and transcripts more accessible to lower level learners. Here, you can find a variety of podcasts and series of podcasts, at a mixture of levels, which are accompanied by listening activities but also – all importantly for our dictation focus – a transcript! I have recently discovered graded readers as a language learner. (I knew about English graded readers as a teacher, but I think you can only fully appreciate them if you use one in a language that you are trying to learn!) What a revelation! I love them! (But that’s for another post…) Of course, as far as this post is concerned, we must limited “graded reader” to those that come with an accompanying audio recording. Learners often get a cd with course book listening recordings or access to a cd rom containing either course book listening recordings or “extra practice” listening recordings/activities within similar topic areas. Transcripts are usually in the back of the student book or embedded somewhere in digital resources like cd-roms. 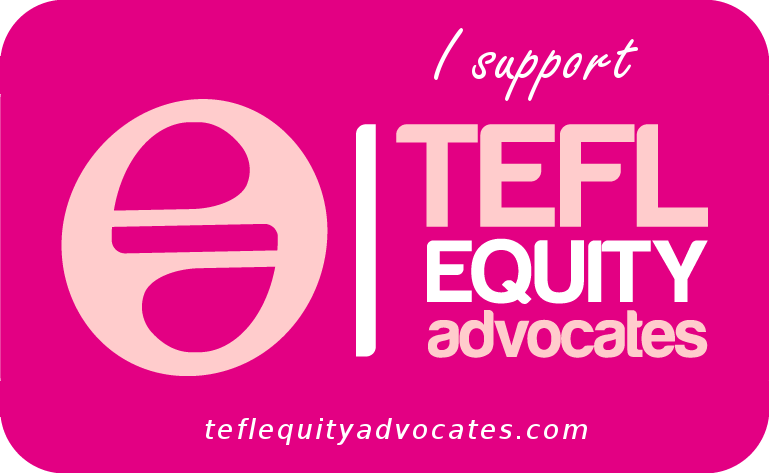 (I know, for example, that this is the case with at least some levels of Speak Out; Headway digital has such materials that students may have access to etc.) As well as doing whatever language/skills practice activities come with these materials, learners could use the recordings and transcripts as another source of dictation practice. Remember the book-and-tape sets you used to get when you were young? Then they became book-and-cd. These are generally aimed at younger native speakers, but can be equally useful for language learners, provided they don’t get hung up on the target age of the materials. Ok, so we’ve established that there is no shortage of potential material for autonomous use of dictations as a learning tool, but what do we do with them? A very good basic approach, which we could easily apply to the materials from both British Council resources and Elllo.org, but it can be extended and it is important to make full use of that “look at the transcript” phase. Don’t panic about only listening and writing once: you have control of the replay button, why not use it! Perhaps in due course you will be able to do it with one listen through, until then it’s ok to be human rather than give up! 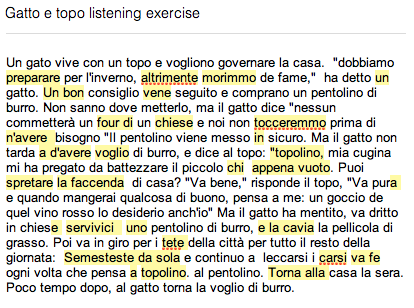 My first Italian dictation with errors highlighted. Note: I haven’t corrected the mistakes, only analysed them. Leave it all for a few days. Yes, uncorrected. After a few days, use your highlighted transcript and repeat the dictation process. Try to correct your errors by focusing particularly hard on the highlighting and trying to remember what caused the mistake. Make any corrections in a different colour so that it is easy to see them. Compare your corrections to the transcript and see how you did this time round. Underline any remaining mistakes/omissions so that they are in evidence. Thus, instead of transcript comparison being: “Oh, I made x number of mistakes, not too bad, will try again next time.” and that being the end of the dictation activity, it becomes an extended learning opportunity. The mistakes are where the learning is. Obviously I benefit from having a reasonable awareness of what contributes to receptive difficulties and therefore can analyse my mistakes reasonably easily. To help learners gain this awareness, why not do the activity with them in class and provide a handout to help scaffold their analysis? 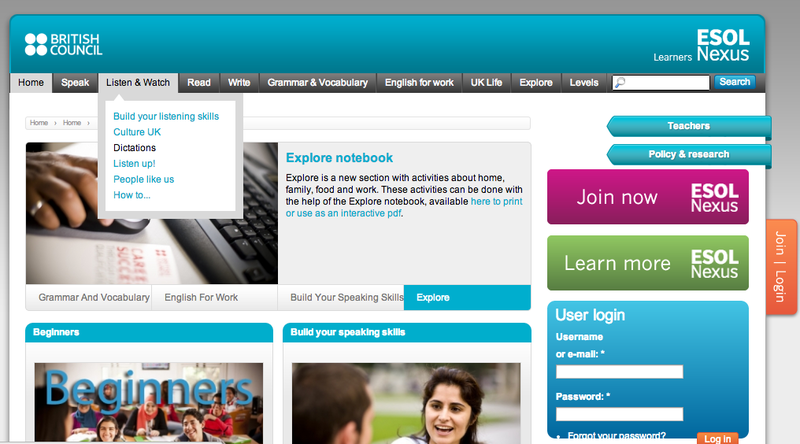 (Such as that found in Vandergrift and Goh, 2012 consisting of a list, written in the first person, of potential error causes, for learners to match to their errors) Of course, as mentioned earlier, the British Council ESOL Nexus site is a good way in to being able to analyse errors more effectively too. 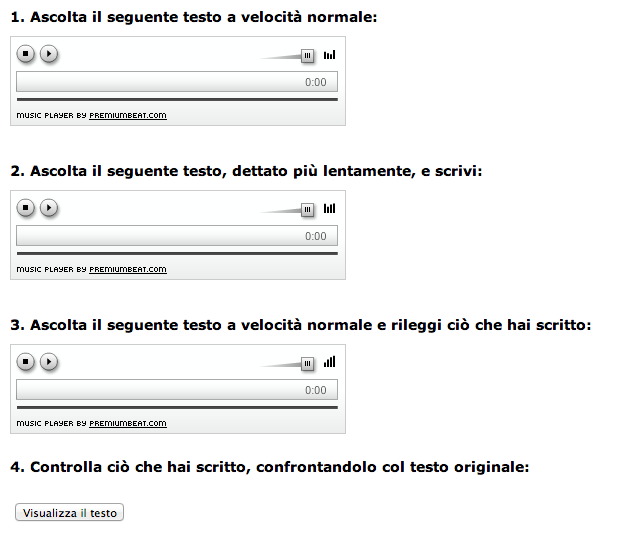 What about when the recordings don’t come with the dictation pauses and are quite fast? That’s ok. There are several ways to work with more challenging recordings in a similar way. Take one minute of your graded reader recording – that is plenty! (It also means you have a lot of potential dictations in one graded reader! 😉 ) I recommend that you listen without trying to write anything first. As per the approach above, where you listen at normal speed before you do the dictation activity. So, listen for meaning. It also works if you do it after having used that part of the graded reader normally i.e. listened and/or read and done the activities in the reader, as long as you let some time elapse before you do so. Listen again and write down any chunks that you can. It’s moving pretty quickly, so you will grab a few phrases and a few words here and there. I did this on the computer, and entered after each chunk. Play it again and try to fill in a few gaps. Repeat until you’ve captured that one minute of recording. 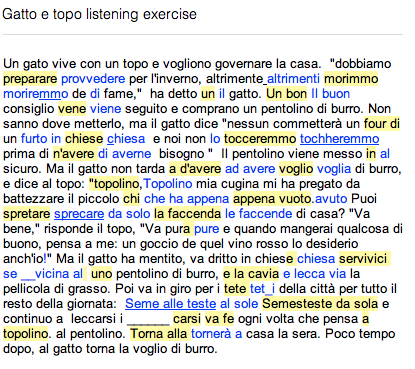 Compare with the transcript – again, thoroughly- as per the approach described with the gato e topo dictation. Here, I have highlighted my errors and put in underlining where I have omitted something. 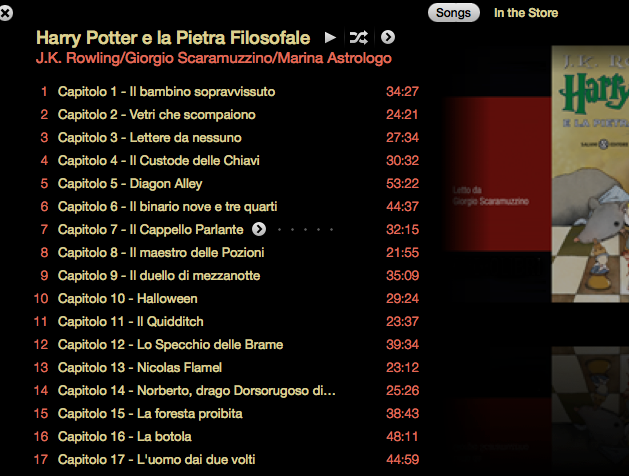 I will return to it in a few days and try to correct those mistakes by listening again. Start as per the chunk-grabbing activity above. After listening and grabbing a few chunks and words, listen again but don’t add anything else. Then use your chunks and words, and what you can remember, and try to reconstruct the text. So, do a dictogloss. Compare your dictogloss with the transcript. 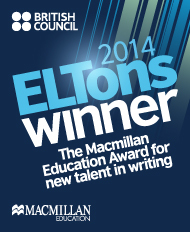 This time you will the analyse grammatical and lexical choices you’ve made as well as what you’ve (mis)heard. point them towards scaffolding resources such as the ESOL Nexus site before you ask them to do the more complex sequences of activities. allow them to report back subsequently, to share successes (or failures, which can then be troubleshot), and help them to maintain motivation. My learners often struggle to recognise the progress they are making and how much work they do put in to their learning – both seem like a drop in the ocean compared to all the lacks – the “I can’t“‘s and “I have no time“‘s that are all too clear to them and tend to be their focal point. Time spent on language study and progress made are quite intangible for a lot of the time, to the person using that time and making that progress. This can lead to lack of motivation and tailing off of initial enthusiasm. Additionally, learners tend to avoid studying unless they have a substantial chunk of time to devote to it. Being busy people, with a range of commitments to juggle, clear hour-long chunks of time do not arise as frequently as they might like. However, what they often don’t realise is that there is value in “little and often” when it comes to language study. When I started my reading project with my learners, I looked for a motivating way for them to record their reading and goals, but wasn’t able to find something that matched what I was after. This remained the case with the “Experimentation with English” project that came next in my series of initiatives. visually appealing: a way to enable learners to see at a glance how they are using what time they do have to dedicate to their language learning/use and to compare this with their own personal learning goals. simple: the learners won’t use it if it’s overly complicated – and who could blame them! Thus, as well as creating a visual of time spent on learning, the idea is that learners are encouraged to reflect on both their activity purposes and learning goals. Visual impact: A learner can look at his/her flower and see immediately how much of their time they are spending on any given skill, in comparison to other skills. Pride: Hopefully learners will feel proud of all the learning that is represented in their flowers, with the flowers playing the role of making that time and study more tangible and visible. 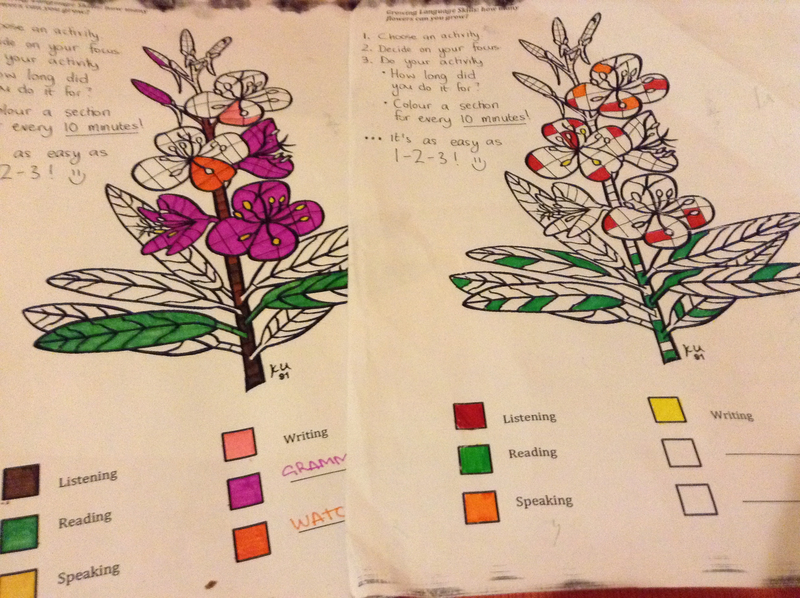 I think that the guided study flowers is important for student because he can notice all the activities he does every day and in this way he can know his improving! So, learning and progress become more noticeable, more tangible. It’s only a very small tool, nothing earth-shattering, but can hopefully make a positive difference. It’s a flower. It’s sissy! Perhaps I need to come up with a design that is appealing to male as well as female learners. 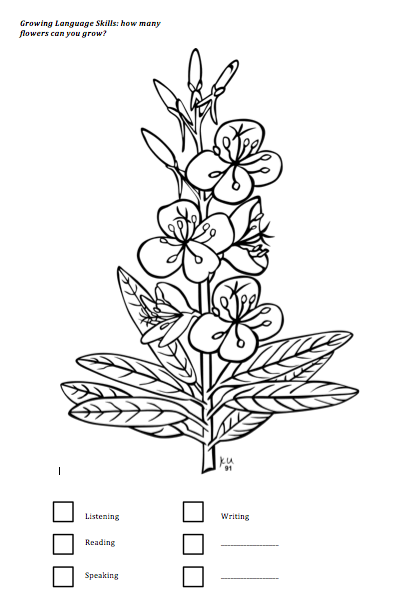 (Not that all female learners are automatically going to find flowers appealing!) Having said that, although the photographed examples are from ladies, a couple of my male learners did also use theirs. I’m planning to redesign it for my next lot of courses. Maybe there will be multiple design options! What about the learners who do loads? Some of my learners are prolific in their guided study and rack up hours and hours and hours. They might find shading every ten minutes of every activity they do rather tedious. I wonder if I could make it so that learners could decide on how many minutes each segment would be worth. Obviously thus far I have only used this idea with two classes, and only for a relatively brief length of time (dictated by when I had the idea!) so it’s still very much in the developmental stage. I’m currently overhauling my learner autonomy projects and trying to create a course plan (parallel course plan? It’s *not* the main course plan, but the idea is for it to run alongside that, as it has been doing but more systematically) that brings them all together systematically, so fitting this idea into that is one of my (many) challenges. Introducing it needs more thought, as does how it is revisited, in order for it to be most useful to my learners in the long term. This of course ties in with the whole challenge of fitting it satisfactorily into the above-mentioned course plan. For this, more thought also needs to go into how best to mine the potential metacognitive benefits, in conjunction with other activities for metacognitive development. I want to make it into an app. I think it’s a fairly straight-forward concept and wouldn’t be difficult to turn into an app. I envisage there being a choice of designs you can use, all of which would be already divided up into ten-minute chunks (or perhaps the student could specify the length of time, within reason – maybe between ten and thirty minutes). Learners would just have to attribute a skill to a colour, with x number of colours available. There could be some completed models with brief commentaries, to demonstrate. 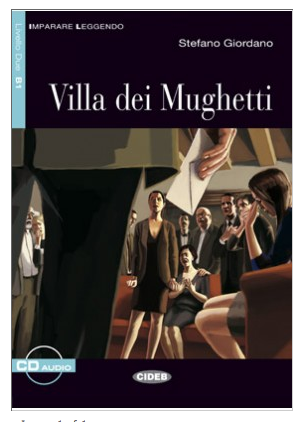 I’d like to try it with my own Italian learning – but that will have to wait until I have access to a printer, since it isn’t an app yet! 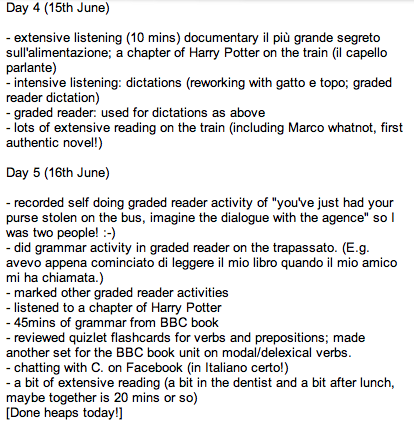 I’d be curious to see how my Italian learning time divides up between skills, especially as I am using my learning contract to try and bring more variety into my learning. I’m sure reading and listening extensively would dominate, but I wonder how everything else would stack up. Which makes me think that perhaps this idea is more intrinsically interesting when you are experimenting with new ways of learning: if you know that all you do is watch films extensively, then you already know which colour will dominate, whereas if you try a range of different activities over time, then it’s less predictable. 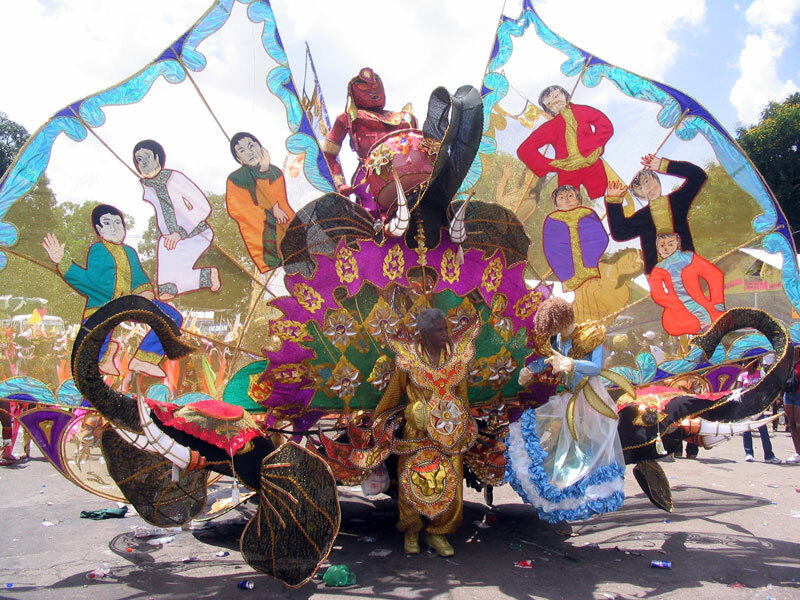 41st ELT Blog Carnival on Learner Autonomy – coming soon! I’m delighted to be hosting the 41st ELT Blog Carnival in June this year and looking forward, very much, to seeing lots of posts written by lots of people, all about learner autonomy – the 41st Blog Carnival topic of choice. Get your thinking caps on, everybody!